SCITUATE – The call from Scituate Police was as surprising as the news that would follow. The department called Caroline Meehan to let her know Cops for Kids with Cancer had selected the Scituate family to receive a $5,000 donation for her 3-year-old daughter, Maggie. The Braintree-based non-profit looks to local police departments and medical groups to find families across New England burdened with hefty medical bills and offers the donation to help. After learning about the Meehan family from Scituate Police, the group decided to award a piece of $17,300 raised at a November fundraiser in Marshfield to the Meehan family. Organization Chairman Robert Faherty presented the check on Wednesday, April 20. Maggie was diagnosed with acute lymphoblastic leukemia in September after her family found unexplained bruising on her body and noticed her neck was swollen. Meehan said she had just finished her maternity leave after the birth of her son, Connor, when she found herself in a hospital for the worst reason. ‘We were in the ICU and she looked fine. She was playing,’ she said of Maggie. She would later learn her daughter’s white blood cell count was in the hundreds of thousands when a high count for a cancer patient was 50,000 to 100,000. Maggie is now in remission, but will undergo treatment through October 2017, and the extra boost from Cops for Kids with Cancer can really help, Meehan said. ‘Five thousand dollars is such a generous amount of money to give someone and we really appreciate it,’ Meehan said. Cops for Kids with Cancer is a volunteer-run non-profit based in Braintree hopes to offer some relief for families facing a difficult time, said Faherty, who is also a retired Boston police officer. The organization tries to help six families each month, offering $5,000 each time. It has supported 442 families and donated more than $2 million since it started in 2002, Faherty said. The donation the Meehan family received was the result of a November fundraiser at Mamma Mia’s restaurant in Marshfield. Marshfield and state police were put to work bussing tables and parking cars to draw a crowd and the restaurant donated a portion of the evening’s proceeds so Cops for Kids with Cancer could help local families. Marshfield Police Officer Michael Egan said the department was happy to help. ‘It’s amazing to be able to help out people that really need it, and their families,’ he said. Susan Penney, general manager of Mamma Mia’s, said she hopes to make the fundraiser an annual event. ‘Once word got out, the response, the donations, the volunteers were overwhelming,’ she said. Now that the restaurant has hosted the fundraiser once, Penney said she knows of ways she can make the next one even better and ideally raise even more money. 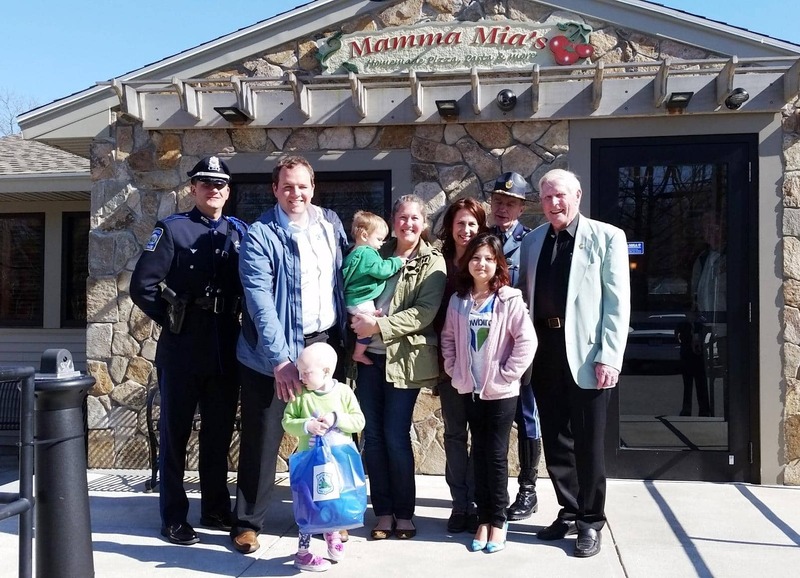 The fundraiser Mamma Mia’s hosted is the ideal model for the organization, said State Police Detective Lt. Bill Coulter, who sits on the organization’s board of directors and was diagnosed with stage 4 head and neck cancer 11 years ago. When a community comes together to help others in that community, it makes a bigger impact, he said. Coulter said the $5,000 for each family may not seem like a lot of money, but it can relieve some pressure. The event raised enough to support at least three families. Joining the Meehan family at the check presentation were a Hingham mother and daughter. Like Maggie, Georgia English had to spend a month in the hospital after she was diagnosed with acute lymphoblastic leukemia in June 2013. It was Boston Children’s Hospital for Maggie and Tufts Floating for Georgia. For Georgia’s mom, Lisa Virello, something seemed off from the first symptom-pain in Georgia’s hip-but doctors thought it could have been typical growing pains or Lyme disease. The evening the doctor called and asked for Georgia to do a bone marrow test, she said she knew. The test confirmed it. ‘We’re on the other side of it, but it’s still something you go through,’ she said.